Can anything be simpler than this for a hot dinner date ??? 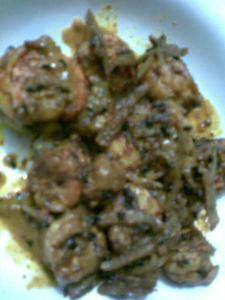 My all time fav prawns..Love any dish with prawns..Looks yummy...very tempting pics...just wanna grab tht plate! Great dish! This is a very common bengali house hold spicing system, Nigela , green chili seasoning, used in vegetables and fish alike. Some times , thin Potato or a bit of egg plant makes this dish great. Thanks for publishing this recipe and good wishes. i must thank you Ushnish for making me rediscover nigella in my cooking , i used to like this prawn but i made it after a very long time and that too when i was reminded of the flavors after trying that fish with nigella n red chilly powder..
You cook non veg too? And that too on a blog with Banaras in the title? Hare Rama! Hare Krsna! Lunch hour at conference. This is the only way I can keep my mind off you know who and you know what!